Statistical Package for the Social Sciences (SPSS) research paper. Why do they hate us? After 9/11, this question was heard throughout American media. Despite the interest about Anti-Americanism in the popular journalism, academic literature on the subject of Anti-Americanism has been surprising limited. 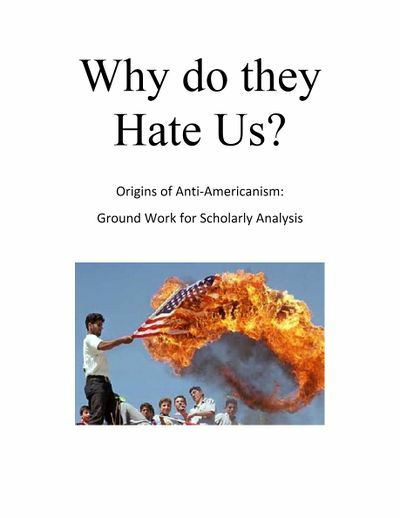 While the limited research around Anti-Americanism has focused on which country's citizens are Anti-American and/or has attempted to quantify what Anti-Americanism is, little existing research has explained the social and economic factors which cause Anti-Americanism. This paper will seek to understand key cultural drivers that have fostered Anti-American sentiment. While outside the scope of this research, these results may contribute to a critical reassessment of the deep-seated roots of third world rage, and help avert future terrorist attack on United States interests. This study sought to identify at a broad level, significant factors that have led to Anti-Americanism in many of the world's countries. The research first analyzed the impact of economic independent variables followed by economic aid and US troop levels. In summary, only military aid and sales showed a strong significant relationship to Anti-Americanism.